When selecting your platinum wedding bands, there are three essential factors to consider: your budget, style requirements and size. Whatever your budget may be, GN Designer Jewellers in Melbourne can find the perfect symbol of your love within an affordable price range. With many style options available, we have a ring to suit everyone. We have plenty of platinum wedding bands in our Melbourne showroom for you to choose from, ranging from simple bands to elaborate and creative rings. If you can’t find the perfect ring in-store, we have some of the finest craftspeople and designers to create custom wedding rings just for you. A personal jeweller will listen to your story, your ideas, and execute any transformative concepts so that your platinum wedding bands can genuinely be seen as an extension of your vision and devotion. It is believed that the custom of wedding rings has existed for over 6,000 years. Relics from ancient Egypt have been found that provide evidence of braided rings being exchanged between spouses. As a symbol of eternal love, the simple wedding ring has no beginning or end and is a symbol of infinity. The rings’ shape can symbolise the sun, moon and planets and the bringing together of all life, they are exchanged at a ceremony and intended to signify your eternal commitment. Today wedding rings come in a variety of designs and shapes, and it comes down entirely to preference and taking into account your lifestyle. Court shaped platinum wedding bands are considered the classic style. They are straight and evenly proportioned right the way around and are slightly rounded on both the inside and outside. This shape guarantees a comfortable fit regardless of width. D shaped platinum wedding bands are also straight on the top and bottom and are curved on the outside while flat on the inside, creating the D shape. If you have an elaborately shaped engagement ring or a large centre stone, you might need a wedding band custom shaped to fit. Width and weight will also need to be taken into account. If the platinum wedding band is to be worn alone, 5 mm is a good standard, though if to be paired with an engagement ring 3mm or 4mm may be best. The weight can also be personalised, coming in sizes classified as lightweight, heavyweight and extra heavyweight. These are merely preferences, and the choice is yours when you choose GN Designer Jewellers for your platinum wedding bands in Melbourne. Platinum is an incredibly durable precious metal, and one of the rarest. Where other white metals may tarnish, or turn yellow, the rich, white radiance of platinum enhances the brilliance of the ring and maintains its luminosity forever. Platinum is a popular choice for jewellery due to its resilience and strength, whether on its own or as a setting for diamonds and gemstones. As a pure metal, platinum is hypoallergenic, so ideal for those with sensitive skin. Platinum is a rare metal, one of the strongest and most enduring, and also one of the heaviest – in fact, platinum is 60% heavier than gold. Platinum is the perfect choice for wedding bands. Its weight and density make it durable, and perfect for wearing every day. Platinum as a metal is strong, rare, and pure, thus making it the ideal symbol of true love. Engagement rings, wedding bands and anniversary rings are often made in platinum to signify the eternal endurance of love. The wedding band is a tradition signifying your relationship, part of the ceremony, but that doesn’t mean the rings can’t be unique to you. 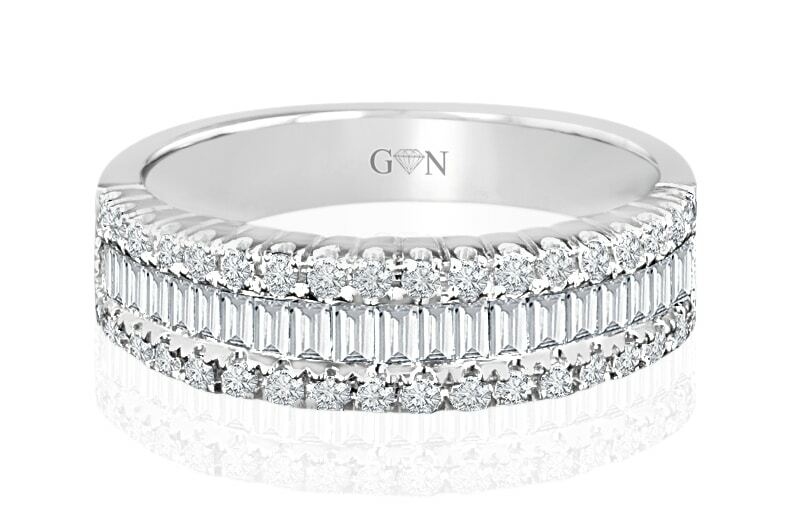 With GN Designer Jewellers you can design your custom wedding bands that embody your personality. An equally significant ring should accompany this significant step in your life. Our expert ring designers and craftspeople can work closely with you and your partner to create a unique set of rings that perfectly embody the commitment you are making to each other. They can be as simple or as ornate as you choose, representing your relationship, and the future you will have together. GN Designer Jewellers can cater to any taste and budget. GN Designer Jewellers offers the option of having your platinum wedding bands engraved with a personal message to make them even more precious and unique. You may wish to have the date, or your names, or a short message that encapsulates your eternal devotion etched into the ring. The engraving can be done in a variety of classic fonts and can add a personal touch to this ancient tradition. Your platinum wedding bands will carry considerable personal significance as well as monetary value, so they deserve the best possible care. At GN Designer Jewellers in Melbourne, we offer lifetime options for care, cleaning and remodelling to protect the brilliance of your platinum wedding bands. We can also help to arrange jewellery insurance, coverage that will provide comprehensive protection against any eventualities. GN Designer Jewellers in Melbourne has over 20 years of hands-on experience in bespoke jewellery making and design. We offer our customers meticulously handcrafted platinum wedding bands all created with care and precision. For more information about platinum wedding bands in Melbourne, you can contact GN Designer Jewellers on (03) 9602 2153, or drop by our store located at 62 Hardware Lane, VIC Melbourne Australia.